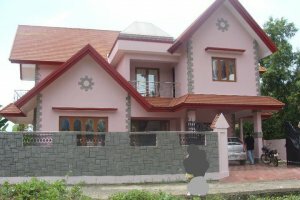 Semi Furnished Independent villa ( 4BHK+study) for sale at Chembumubu Kakkanad Kochi. 950 meter from the Chembumuku junction, plot size 7.5 cents with 3080 sq. ft. built up area, 4 spacious bedroom, 3 with attached bathrooms, 2 Kitchens, one fully done with cupboards, Ground floor having 2 Bedrooms and 2 bathrooms Living and Dining area and two sit outs, First floor also having 2 Bedrooms, TV hall, study room, laundry area and 3 balconies, Vitrified/designer flooring, Both Municipal and well water available and 3 phase power connection. Close proximity to markets, Offices, worship houses, schools and hospital. Interlocked tiled road all around the property. Pictures of the house are posted along this ad. Interested party contact for more details,.. Pl call.. Nine, four, nine, six, eight, one, six, seven, two, Zero.